Easterseals Iowa provides exceptional services to ensure that all people with disabilities or special needs and their families have equal opportunities to live, learn, work and play in their communities. We provide a wide range of support for children and adults with disabilities to promote independence and opportunities throughout their lives. What types of services does Easterseals Iowa provide? Are Easterseals Iowa services limited to specific types of disabilities? No. Easterseals Iowa is committed to caring for children and adults with physical and intellectual disabilities, mental illness and special needs resulting from any cause—whether diagnosed at birth or incurred through disease, accidental injury or the aging process. How many people receive Easterseals Iowa services each year? Easterseals Iowa serve more than 3,500 people annually. How is Easterseals Iowa supported financially? Easterseals Iowa receives funding from a variety of sources, including private insurers, government agencies and fee-for-service. Many generous families, individuals and businesses also support Easterseals Iowa to supplement the actual cost of programs versus what clients can afford. Help us to continue to provide exceptional services by making an online donation. 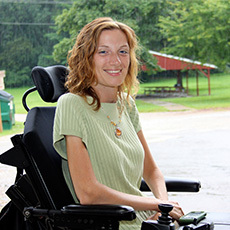 Easterseals Iowa is proud of putting your donations to work effectively. More than 93% of funds raised through Easterseals Iowa directly support our program services. The National Health Council has cited Easter Seals as a nationwide leader for percentage of dollars raised going directly to client services. All funds raised stay in Iowa. Is Easterseals Iowa a nonprofit organization? Yes. Easterseals Iowa is a nonprofit provider of health and human services, incorporated under the provisions of Section 501(c)(3) of the Internal Revenue Code. Easter "seals" are stamp-like seals that were first created in 1934 to raise money for services benefiting children with disabilities. Then known as the National Society for Crippled Children, the organization was re-named "Easter Seals" in 1967, reflecting the public's awareness and acceptance of the campaign. Easter "seals" still exist today. How can I support Easterseals Iowa? Easterseals Iowa's continued success in providing services to people with disabilities would not be possible without our dedicated donors and volunteers. Learn more about giving to Easterseals Iowa or about volunteer opportunities. Your personal commitment enhances the services we provide to our clients.